My condolances, Green Genes, I hope your country will not be savaged by riots tonight. Thanks Beeps, I hope that is not the case. Thank you GG. I'm very sorry for your team,your people, and my girlfriend. 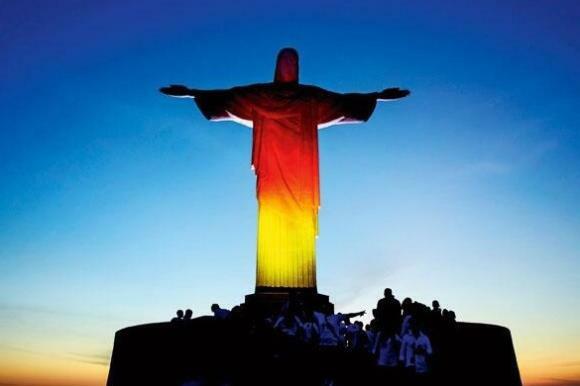 This is what the German team posted on facebook: Caros Brasileiros. Primeiramente gostaríamos de agradecer pelo carinho que estamos sendo recebidos por todas as pessoas em cada momento da nossa estadia no Brasil. Fora isto desde 2006 sabemos como é doloroso perder uma semi-final no próprio país. Desejamos tudo de bom e o melhor para o futuro para vocês. 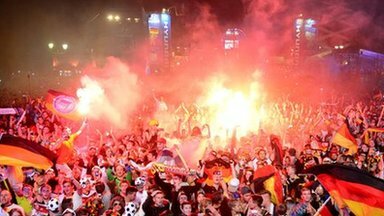 - I'm sure the Brazilians would support the Germans and not their "beloved" neighbours. I've seen this thread in the unread posts listing....is this for rugby or something? Yeah. Argentina has Messi, so Holland brings up a strong defense. Orange has Robben, so Argentina brings up a strong defense. Net result is a boring match in which we could see neither one of these great players shine. Germany take on Argentina in the World Cup final tomorrow, well, that’s what most of us know. North Korea’s controlled media are telling their country that the national team have reached the World Cup final in Brazil. We’ve known for some time that leader Kim Jong-un controls what the people of his country hear, and this time North Korea are in the final of the World Cup. Urm, they didn’t even qualify Kim? In a Youtube clip, the media are recorded reporting that North Korea are close to claiming the biggest prize in football. They also report that North Korea cruised through the group stages with a 7-0 win over Japan, 4-0 against USA and a 2-0 victory when they ‘faced’ China. None of these actually happened, of course. The news report included footage of the matches that were clearly played years ago. North Korea will face Portugal in the final of the World Cup (Well, thats what they think). Sorry, I was a bit excited when I wrote this. Pleased for germany - Messi was very good natured about it all. I'm talking about present, what can you say about booing your own team? I say God writes straight upon curved lines, because I wonder what would happen if Argentina played Brazil at Maracanã*... Now it kind that diminishes the shame of that cruel beating we took, since we took from the well deserved capital C Champions. *What if we would loose... You are young, and I don't want to bully you, I was only repeating the cultural behaviour patters for the Br-Ar rivalry, because I was sort of cheering for Argentina yesterday and I believe Ar had a better team then us in the Cup this year (although the outcome for such confront is always unpredictable). Congratulations My_Name_Doesn't_Even_Sound_Like_Fritz, will you be in training to defend your title in four years?